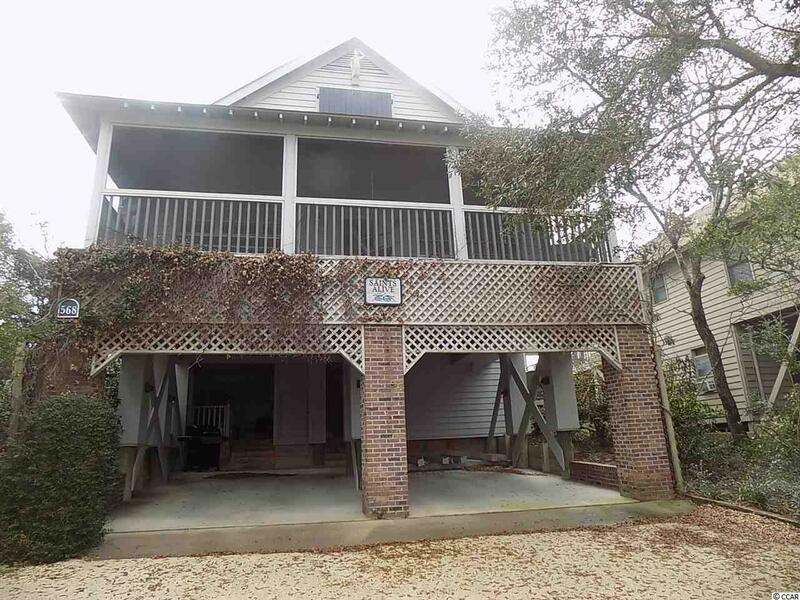 Welcome to Saints Alive a premier Pawleys Island ocean front home in the historic district with dock on Pawleys Creek. This is it. 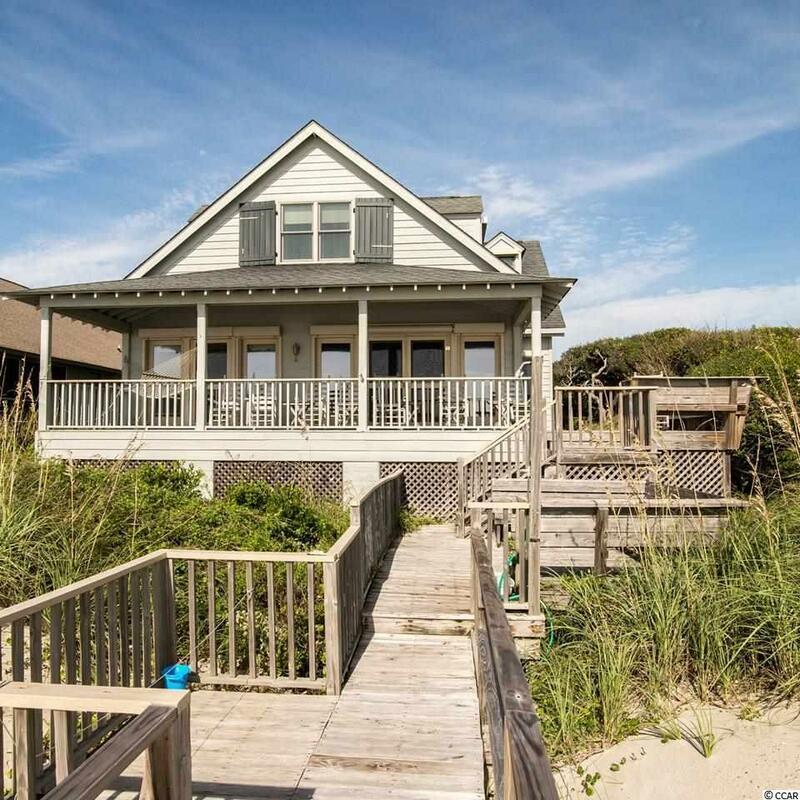 The best that Pawleys has to offer in location is topped by this fine home with outstanding details and floor plans. All interior walls are of pickled Cyprus wood. Large decks and porches for gathering with open living/dining and kitchen for the crowd. 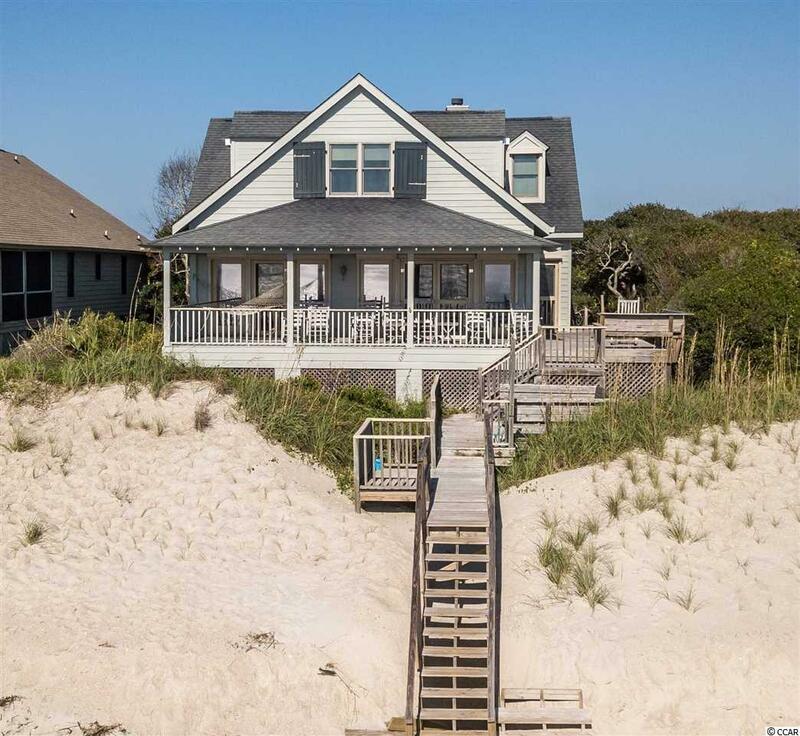 The home, unlike many other beach homes, also invites you to a private den with a wood burning fireplace for card and board games. The large kitchen contains a masterpiece. A hand designed and professionally installed dumb waiter that delivers your groceries and luggage from your car to the kitchen above with perfectly counter balanced smoothness. It will wow your guests and friends. The first-floor ocean front master has a full bath with separate shower and tub and the walls are hand painted by a local artist on original design. A work of art! .The other creekside bedroom has its own private bath. Second floor bedrooms include large ocean and creek side masters with private baths on with a third middle double bedroom with private bath. A comfy tucked away extra single bedroom available in the upstairs master suite brings the total to six bedrooms . 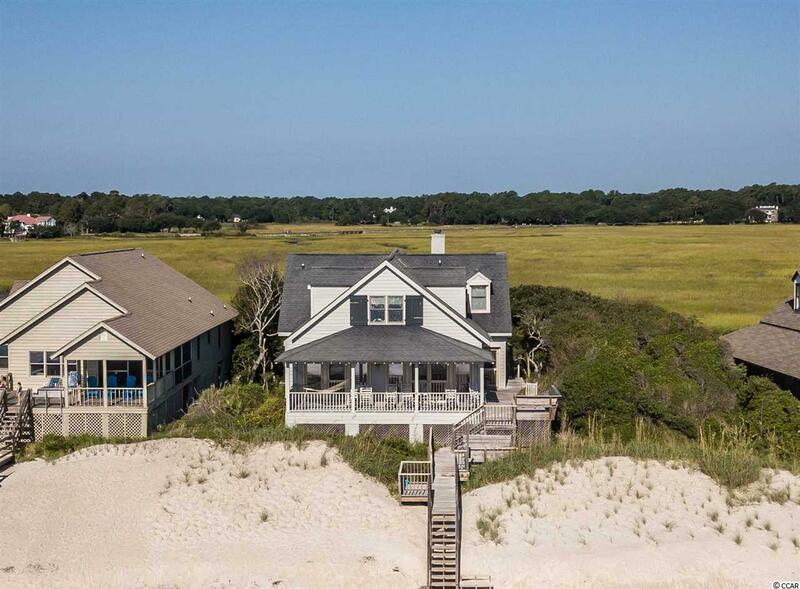 Views are outstanding of both the beach and Atlantic and the marsh and creek. Most furniture will convey but the artwork does not, and a list is available for buyers to view of the other items in the Associated Documents section. The unique design of the second floor creates spacious areas with interesting angles. Pawleys is proud of its heritage and very proud of its mid island historic district homes. This is one of the finest examples of a modern home built in 1993 that is constructed true to the Pawleys historic themes. All hallways are wide, and ceilings are high. The first floor hallway includes a powder room with 1/2 bath. Grand is the word for this property. The ocean porch is 10 feet wide and 30 feet long and unscreened as the ocean breeze blows the bugs away. On the Creekside, the back porch is 9 feet wide by 30 feet long and screened with a porch swing, glider, and picnic table for fun and comfort. All porch floors and outside steps are made of Cyprus wood. Outside shower under house is not overlooked. Beach walkout and sitting area is a favorite spot but oh the dock on the creek will call you to cocktail hour and many sunsets. Enjoy the water level with crabbing and fishing always available. All second-floor windows have been upgraded in the past two years to Anderson and over half of downstairs upgraded to Anderson in 2018. All first-floor ocean front windows/doors have aluminum roll down shutters and living room/dining room windows have working wood shutters for look and protection. All second-floor dormer windows have aluminum roll down shutters for protection. Second floor ocean front and creek windows have working wood shutters for look and protection. Of note on maintenance. Two hot water heaters service home; new in 2016 and 2014. Two HVAC systems new in 2016 and 2014. Premium mattresses for all beds new in 2017. New roof with GAF Timberline Charcoal shingles in 2006 We ask you to verify our measurements and our best estimate of measurements should be rechecked by the buyer. Kitchen Range Dishwasher Garbage Disposal Refrigerator Microwave Breakfast Bar Pantry Range Hood Stainless Steel Apps.